Our partner school is located in the middle of the colonial centre, in a low building with a patio. There are five classrooms, all with the name of a region in Colombia. Of course there is wifi, a small lounge with computers and in the breaks you can get healthy smoothies, juice or coffee. In the patio, the students meet during the breaks and after the lessons. Each week, the language school organizes three free activities. These include, for example, a salsa lesson, cooking class, movie night, guided tour of the old town, visit to museums, karaoke, etc. In addition they organize an excursion every weekend. For instance, to the Islas Rosario, where you will visit the island group and go snorkeling in the crystal clear water. Or a canoe trip through "Cienaga de la Virgen", an ecological tour with a guide. You can also take a "bath" in the volcano Totumo. And there are many more things to see and to do. Joining the intensive course, you have the choice between 20 or 30 lessons per week. There are 6 levels, according to the European Framework (A1, A2, B1, B2, C1 and C2). With 20 lessons per week, attention is given to all aspects of learning the language: grammar, vocabulary, writing, reading, pronunciation and of course also to fluency. For a supplement of € 14 per Person and week it is possible to book a host family with air conditioning. If you are interested in this please make a note in "remakes" in the booking form. Prices of Single-use appartements can vary depending on the type of apartment that is available. Prices refer to basic apartments; prices of superior apartments (including hot water and AC) are on request. The price mentioned is for an airport transfer up on arrival in Cartagena. The missed lessons of these days will not be rescheduled. The individual lessons can be designed completely according to your wishes. The language school would like to know in advance if you want to learn business Spanish, and perhaps even for a specific occupation (financial, legal). The combined mini group course combines 20 lessons in groups with individual tuition. You can help to decide about the contents of these extra lessons, for example, you can choose additional conversation and culture lessons but you can also choose something very different like literature, business Spanish or medical Spanish. During your stay in a Colombian host family you will get to know the culture of the country really well. You will take part in the daily life of the family and get a glimpse of the real Colombia. You will stay in a single or twin room with half board (breakfast and dinner). 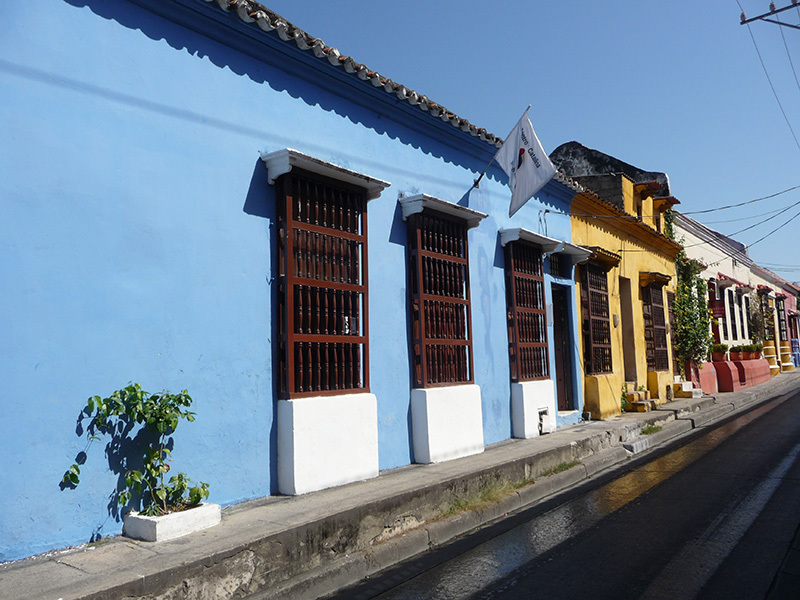 In Cartagena the host families are all located within 25 minutes walking distance from the school. You will share the apartment with maximum one other student from the language school. You will stay in a single room on a self catering basis. In a single-use apartment you will have all the facilities for yourself. If you are interested in this option, we recommend you to book in advance, as there are only a few apartments available. Please note the standard price does NOT include hot water, since the location has a warm weather all year (between 30 and 35 degrees Celsius), so people use to have “cold” showers. However, if you prefer, you have the option of booking "hot water" (see supplement under the price table). If you chose to stay in the students’ residence you’ll stay in a residential neighbourhood, outside of all commercial and touristic places, but close enough to go to the old city on foot (around 15-20 minutes). The residence is a big modern house with two floors and in total 8 private bedrooms, of which some have a private bathroom (bookable against a supplement). Each floor has its own kitchen where you can prepare your meals together with your fellow students. There is also a nice terrace where you can have a BBQ and organize some parties. The location is really nice with plenty of facilities, as you have access to a soccer field, lovely parks, and many shops where you can buy food and drinks. This is an excellent option if you want to immerse yourself in the Colombian real way of life with the other students of the school.